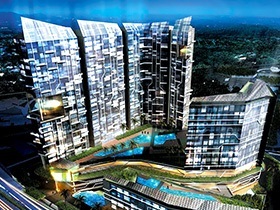 IOI RIO City @ Bandar Puteri is a 72-acre metropolis consisting of secure work spaces, retail offerings, hotel and residences; all interlinked with landscaped walkways and retail streets interlaced with green spaces. People working and living here will be able to relax in a private green oasis while maintaining a busy lifestyle with everything available within the immediate vicinity. Privacy at residential areas are preserved through separate access points and buffered with dense landscaping. The other facilities include a lap pool, private function room, barbeque corner, state-of-the-art gymnasium overlooking the pool and also a cabana. In terms of security, residents need not worry as there will be panic buttons at the car park and inside the unit, access cards a the lift lobbies, CCTV in the car park, digital locks at the main entrance and voice intercom. All the commercial highrise buildings will be GBI or Green Mark certified. Other green features include water saving cisterns, low VOC paint, natural lighting and cross-ventilation designs.